Volume XLII members list in in 1909 - Elected 1909 Randall, H. J. The Rhyl, Bridgend. 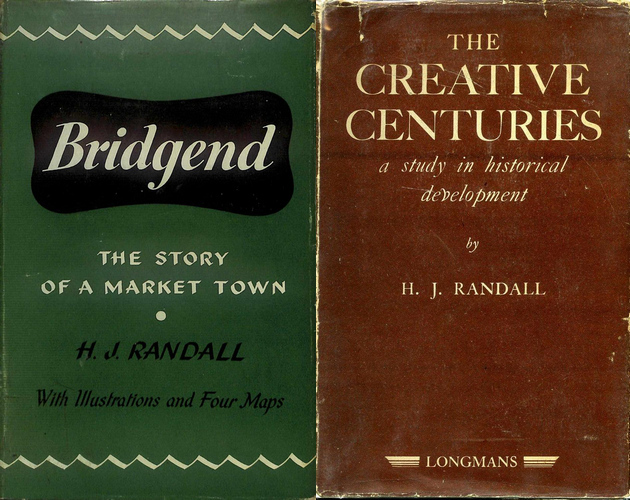 Volume LXIV Archaeological section report 1931 - The Camp on the Ogmore and the Englishry of Coity,"
Volume LXVIII members list in in 1935 - Elected 1928 Randall, H. J., LL.B., "Erw Graig", Bridgend. 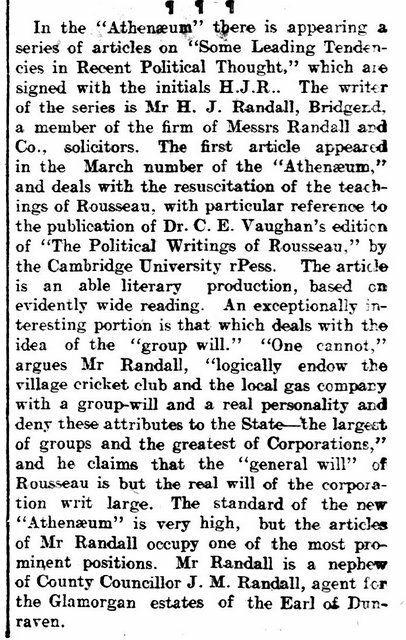 There are also very many reports in the Scanned newspaper archives recording his actions as a Solicitor. He was practicing until 1963 when it is recorded in The London Gazette, 2nd July 1963 that he retired shortly before his death. Notice is hereby given that the Partnership heretofore subsisting between' us the undersigned Henry John Randall, Martin Camillo Verily and Edmund Onslow Powell, carrying on business as Solicitors at 5 Court Road, Bridgend, Glamorgan, under the style or firm of RANDALL, LLEWELLYN & VERITY, has been dissolved by mutual consent as from the 30th day of June 1962 so far as concerns the said Henry John Randall who retires from the firm. All debts due to and owing by the said late firm will be received and paid by the said Martin Camillo Verity and Edmund Onslow Powell who will continue to carry on the said business under the same style or firm. Dated this 28th day of June 1963.